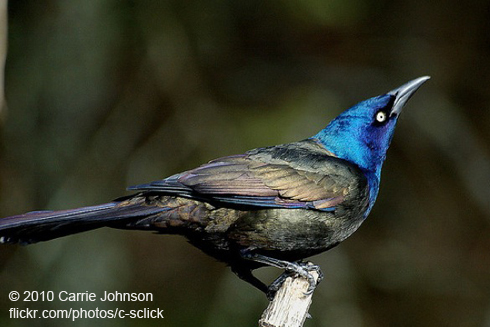 Despite their seeming abundance, the numbers of Common Grackles have shrunk by 60% in the last 40 years. Grackles prefer open landscapes with scattered trees, and their numbers peaked as eastern forests were cleared for agriculture in the 18th and 19th Centuries. As eastern forests grew back in the 20th Century, Common Grackle habitat shrank. A far more alarming cause is active persecution. Grackles gather in large roosts near humans, and because they are perceived as agricultural pests, they are routinely exterminated in large numbers. The destruction of night roosts also kills birds in addition to grackles, such as Rusty Blackbirds, whose population is in dangerous decline. Few birds of eastern North America seem more conspicuous than Common Grackles. Yet even common birds have vital conservation stories to tell. [Common Grackle calls] Familiar in many backyards, Common Grackles are a type of blackbird. The males glint with purple or bronze iridescence. A far more alarming cause is active persecution. Because grackles gather in large roosts near humans and because they?re perceived as agricultural pests, they are routinely exterminated in very large numbers ? sometimes by the millions. Communal night roosts are sprayed with a surfactant, a detergent-like substance that strips protective oils from birds? feathers. When the birds get wet, they die of hypothermia. For the Common Grackle future wildlife management requires greater precision and foresight. For BirdNote, I?m Michael Stein. The sounds of a flock of Common Grackles comes from Xeno Canto xc71558 Mike Nelson. Call of single Common Grackle provided by The Macaulay Library of Natural Sounds at the Cornell Lab of Ornithology, Ithaca, New York, 133330 recorded by G.A. Keller. Suburban ambient recorded by C. Peterson.